Employer branding tools: How to make your brand a powerful recruitment asset in Japan? Staffing and Recruiting is one of the main challenges a company can face when entering the Japanese market. The talent shortage continues to rise year on year which causes growing difficulties to companies trying to attract talent and scale their business in a complex market. Top candidates and A players have plenty of options available and are becoming more demanding. For them, it’s much more than just about the paycheck; it’s about what the brand stands for, about the working environment and the team, about the opportunity to grow as a professional and about the feeling of getting a job that has a true purpose. Traditional recruiting as we know it is “History” and business leaders are now required to get creative and more involved in building a robust recruiting strategy with their HR. Their ability to offer a superior candidate experience and become an employer of choice will be key in determining their success. To help employers in Japan compete more efficiently and build effective recruiting strategies, HirePlanner.com is proud to announce the release of its brand new recruiting advertising and branding platform. This new upgrade comes with a fresh new design and has been built to help businesses maximize the visibility of their job postings and to brand themselves as a true employer of choice. 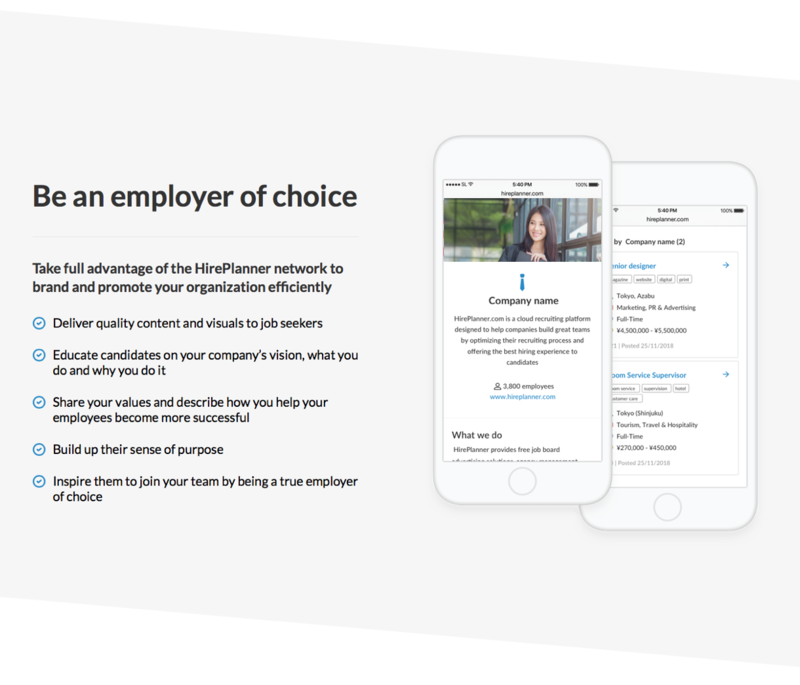 Thanks to the new HirePlanner recruiting branding tool, companies can now get creative, customize their message to candidates, promote their benefits and values, and make their organization an inspiring one to work for. 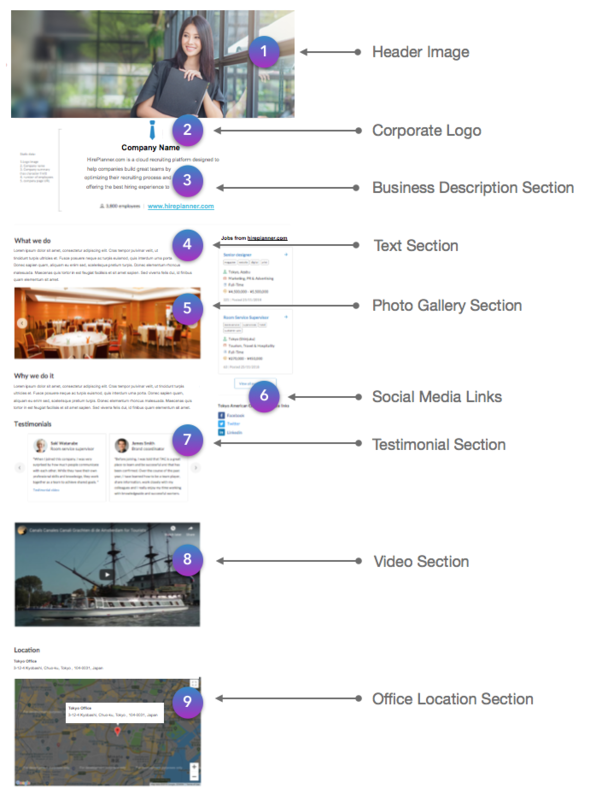 Your career branding pages are fully customizable (in both English and Japanese) and you can now include an image header, corporate logo, description of your business, random text sections, photo galleries, social media links, testimonials from employees, videos links and multiple office locations. Once published, your branding page will be accessible to your candidates when they visit your career website or when they search for jobs on HirePlanner.com (See layout example attached below). 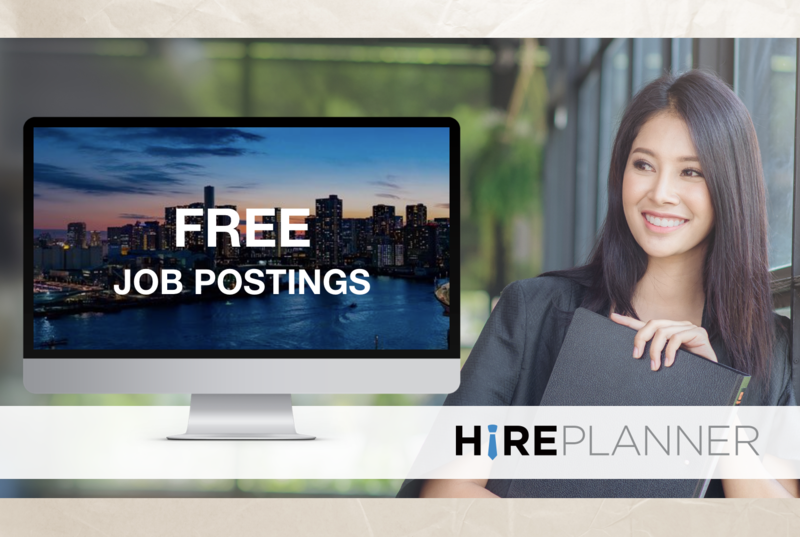 – FREE ADVERTISING of your job postings on HirePlanner.com and multiple other Japan focused Career Portals and Job Sites.